There aren’t many things more synonymous with the western world than the sport of Rodeo. As proud supporters of local, regional and national rodeos, we are dedicated to doing our part to help advance the sport, athletes and industry. As part of that promise, this week we are celebrating the future of rodeo by spotlighting three high school rodeo student-athletes for National Student-Athlete Day on Saturday, April 6. These athletes stand out by excelling in the classroom, in the community and on the dirt. As a 9th grade student from Milford, Indiana, Leah Freeman is a member of the Indiana High School Rodeo Team, Elkhart County Saddle Club, and the FFA. Leah is dedicated to giving back to the community by being active in various service projects locally and worldwide through her local FFA chapter. This past Christmas they packed over 50 boxes to be sent around the world for Operation Christmas Child. In 2016, Leah’s family purchased Donk, a 5-year-old horse with very little training. Leah spent countless hours working with her and was determined to make Donk her next barrel horse. 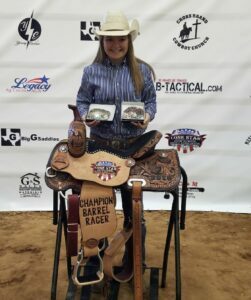 Her dedication paid off in the summer of 2018 as they became Reserve Champions at the Indiana Junior High Rodeo State Finals, punching their ticket to the National Junior High School Rodeo Finals. 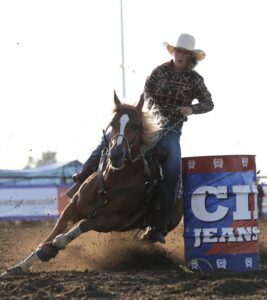 Now, a freshman on the Indiana High School Rodeo team, they compete in barrel racing, pole bending and breakaway with the hopes of winning a state and national championship during her high school career. In addition to her success on the dirt, Leah is an all-star in the classroom as well as having earned honor roll distinction every semester. There aren’t many evenings you won’t find Justin Tomlinson practicing his roping either with live steers or with the dummy. Justin was born and raised in Charlotte, North Carolina and has been riding all of his life but didn’t start rodeoing until 2014. 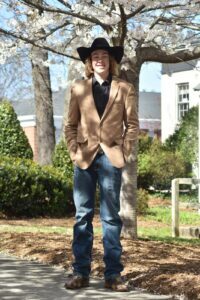 Competing in chute dogging, calf roping and team roping, Justin competes in the Jr. Southern Rodeo Association, North Carolina Youth Rodeo Association and North Carolina High School Rodeo Association and won a reserve All-Around and breakaway title last season. Justin works hard around the farm doing odd jobs to earn enough money to pay all of his own entry fees in three different rodeo associations. Justin is also very dedicated and motivated in the classroom. Despite his busy rodeo schedule, Justin devotes time to his studies to maintain a spot on the A/B honor roll while taking all honors and AP classes. Hailing from Lindale, Texas, Laramie Wedeyemer’s passion for the western industry is illustrated in everything she does. As the President of the Lindale FFA chapter, retired Student Advisor for the Mineola District FFA, a member of the National Honor Society, student board member for Texas Bank and Trust and a church camp counselor for Camp Wow in Oklahoma, Laramie is an inspiration to her peers. Her dedication to serving and giving back never goes unnoticed. In addition to being active and serving around the community, Laramie also has found success on the dirt in roping and running barrels. She is a LSHSRA Champion barrel racer and State Fair of Texas Youth Rodeo Champion barrel racer. Congratulations to these outstanding rodeo student-athletes!